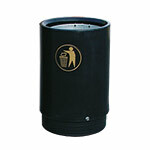 Victorian Style Open-Top Litter Bin With Easy Access. Whether you're walking through a park, towards a shop entrance or outside a business, if a litter bin isn't present its likely that rubbish will start to build up. An accumulation of rubbish will not only ruin the look of the surrounding landscape but it may also harm a business' image. With so many different styles and finishes available choosing the right litter bin for your needs can be a difficult choice. 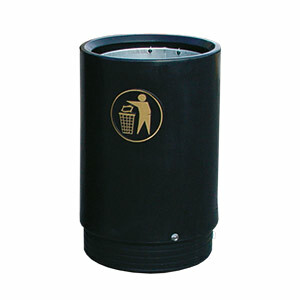 These Victorian style bins with their open-top design not only allow any passers-by to dispose of their rubbish easily but this design will easily fit into a range of different environments. These 485mm diameter bins are designed with a capacity of 75 litres and include a zinc coated liner, this liner can be removed to facilitate easy emptying and the liner can be locked inside the bin thanks to the lock located at the base of each unit. E321775 - Couple of marks on new bins. Packaging damaged on receipt.